Established in 2015, this online casino is licensed in Malta and has started to emerge as one of the leading slots sites in Europe. 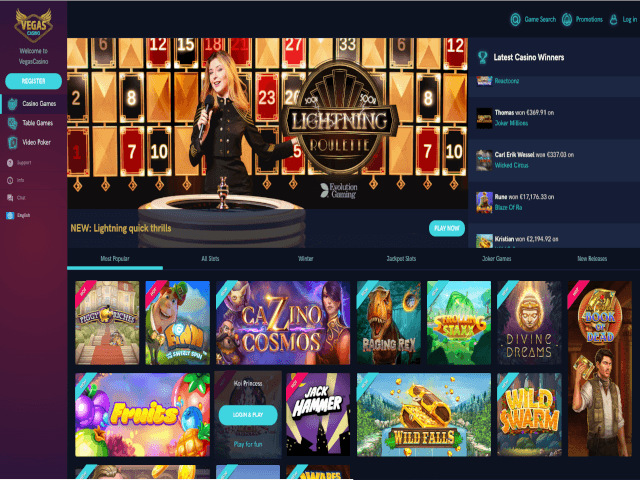 By partnering with three popular yet distinctly different software suppliers, VegasCasino.com has put together a collection of spinners that will pique the interests of all player types. What’s more, you’ll find one of the most impressive free spins welcome bonuses around when you create your first account. To show you what we mean, here’s our VegasCasino review. As an instant play platform, VegasCasino is easily accessible via any device. Regardless of whether you want to take a spin via your PC, Mac or mobile, the site’s software will bend and shape to your screen’s dimensions. 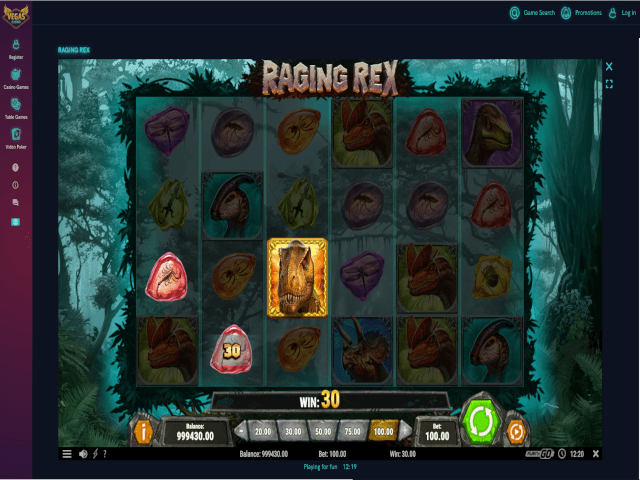 This operator has partnered with three of the best slots providers in the business: NetEnt, Play’n Go and Yggdrasil. NetEnt is behind many of the industry’s leading slots, including Planet of the Apes, Starburst and Gonzo’s Quest. You’ll also find a ton of innovative spinners courtesy of Play’n Go and Yggdrasil. Packed with clever features and immersive bonus rounds, the likes of Double Dragon are fantastic additions to this online casino. At VegasCasino.com the thing struck us was the layout of the lobby. Instead of small game icons and tightly packed boxouts, everything is bright and bold. Other nice details are the dynamic features. As well as a list of winners scrolling across the top of screen, each game box comes to life when you roll your mouse pointer over it. If there’s one small criticism, it’s that there could be more tabs and filters. Although the slots lobby (actually named 'casino games') provides a few category headings, table games and video poker are a little harder to navigate. In total, there are 348 spinners to choose from, which covers the main bases in terms of stakes, themes and styles. When you scroll through the lobby, you’ll see everything from superhero slots and movie-themed games to fruit machines and Asian titles. For seasoned spinners, 348 might seem like a fairly limited selection. However, it’s right in line with the industry standard and VegasCasino has endeavoured to strike the right balance between quantity and quality. Does Vegas Casino Offer Progressive Jackpot Slots? Yes. Although you won’t find some of the best-known jackpot slots such as Mega Moolah (which is by Microgaming), you can still play for six-figure payouts. Alongside popular options such as Divine Fortune, you can spin the likes of Super Lucky Frog and Gunslinger Reloaded. These are potentially lucrative, and they're jackpot slots you don’t commonly find elsewhere online. So, where VegasCasino misses out by not having Mega Moolah, it makes up for it by offering interesting alternatives. Can Players Demo Vegas Casino Slot Games for Free? To ensure everyone can have some fun, VegasCasino allows you to access demo slots. 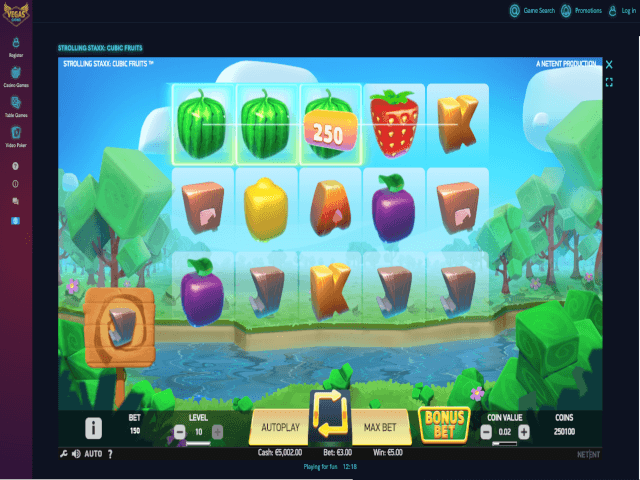 Although progressive jackpot games are excluded from the free-play feature, you’ll still have the opportunity to play 300+ video slots and not pay a penny. When it comes to payments, VegasCasino.com abides by regulations set out by the Malta Gaming Authority (MGA). This means your funds are stored in secure, segregated bank accounts. To make a deposit or withdrawal, you’ll be able to use Visa, Skrill, Paysafecard, Neteller and EcoPayz. One clause to note is the wagering limit you’ll need to hit before requesting a withdrawal. As per the site’s terms and conditions, you’ll have to wager the size of any deposit once before requesting a withdrawal. Additionally, when you hit a cumulative total of 3,000 credits (i.e. your native currency), VegasCasino will ask you to verify your identity. VegasCasino has one of the best welcome bonuses we’ve seen in a long time. In simple terms, you’ll receive 20 free spins on Penguin City and up to 200 credits (in your native currency) when you make your first deposit. However, the bit that stands out is the fact your free spin wins are wager-free. Therefore, whatever you win from these will be yours to keep without any restrictions. That’s not a deal you’ll find at too many other online casinos. The only thing that’s worth noting is that this deal isn’t open to all countries, so check you're eligible for it before proceeding. Finally, VegasCasino.com is regulated by the MGA, which means it follows some of the highest regulatory standards in the world. As part of its licensing conditions, the site has been secured by SSL encrypted software and all games are certified as fair by third-party testing agencies. If you do run into any issues during your time online, you can contact the customer service team via email ([email protected]) during the following times: Monday to Saturday from 10am to 10pm and Sunday from 12am to 8pm (all times CET).